BANGI, 4 August, 2010 – Five outstanding graduates of University Kebangsaan Malaysia (UKM) will receive awards in conjunction with its 38th Convocation for excellence in their studies and active in co-curriculum. Two of the graduates will receive The Royal Education Award. They are Nazirah binti Hassan, 23, who will be graduating with a Bachelor’s degree in Social Science with Honours in Human Development from the Faculty of Social Sciences and Humanities, will also received the Book Prize for the faculty. Nazirah plans to continue her studies until she achieve her Ph.D as she aspires to be a lecturer in counselling. Sophia Marie Chung Suet Wan, 24, who will obtain her Bachelor’s Degree in Accountancy with Honours from the Faculty of Economy and Business also won the Tan Sri Halim Saad Award. She is working with Sime Darby which sponsored her studies. Sophia also plans to further her studies in accountancy by sitting for the professional certificates. Both of them achieve good results in their academic fields and also active in co-curriculum activities, contribution to the society by carrying out voluntary social services. They will each receive a gold medal worth RM1,000 , RM5,000 cash and a certificate of appreciation. Dr Farin binti Masra, 24, who will receive her Medical’s Degree from the UKM Medical Faculty is awarded the Vice Chancellor’s Award. Dr Farin will also receive the Book Prize for the faculty and the Paediatric Book Prize of Dr Abdul Malek Abdullah. She will receive RM2,500 cash dan books from UKM Publishers. Dr Farin plans to further her studies in paediatrics dan become a lecturer. 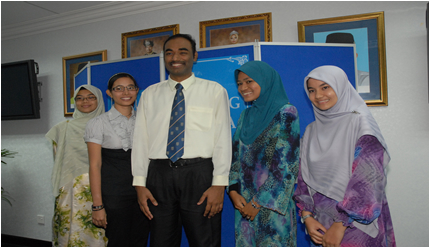 Two graduates will receive the Tun Abdul Razak award donated by the Tun Razak Foundation. Syakirah binti Edrus, 23, who obtains her Bachelor’s Degree in Islamic Studies with Honours in Dakwah and Leadership will receive the Book Prize for the faculty . She plans to further her studies in counselling. Muhammad Adnan bin Pitchan, 24, graduated with a Bachelor’s Degree in Social Science Honours in communications and public policy from the School of Media and Communication Studies, Faculty of Social Science and Humanities. He will also receive Book Prize for the faculty. Adnan plans to be a lecturer and is now pursuing his Master’s degree in public policy. Both of them will receive RM1,000 and a gold medal worth RM1,000.